A Texas school contractor says she lost her job because she won't promise not to boycott Israel. Now she's suing. The school severed its contract with the speech pathologist because of state law banning Texas government contracts with companies that boycott Israel. Bahia Amawi had been working as an independently contracted speech pathologist in Pflugerville elementary schools for nine years when she was notified in August of a new job requirement. She could still work at identifying students' speech delays and disorders. But now, she also had to promise that she wouldn't boycott Israel. That requirement may have seemed like it didn't have much to do with speech pathology. But the new clause in her contract was a result of a long-debated anti-boycott, divestments, and sanctions bill that Republican Gov. Greg Abbott signed in May, effectively making it illegal for Texas government entities to contract with companies that boycott Israel. Amawi, who conducts bilingual and early childhood evaluations as the district's only certified Arabic-speaking speech pathologist, refused to sign the addendum. As a result, she was informed that she couldn't be paid, and her contract was terminated on Sept. 17. On Monday, she filed a federal lawsuit against the Pflugerville district and Texas Attorney General Ken Paxton, saying the law violated her First Amendment rights. 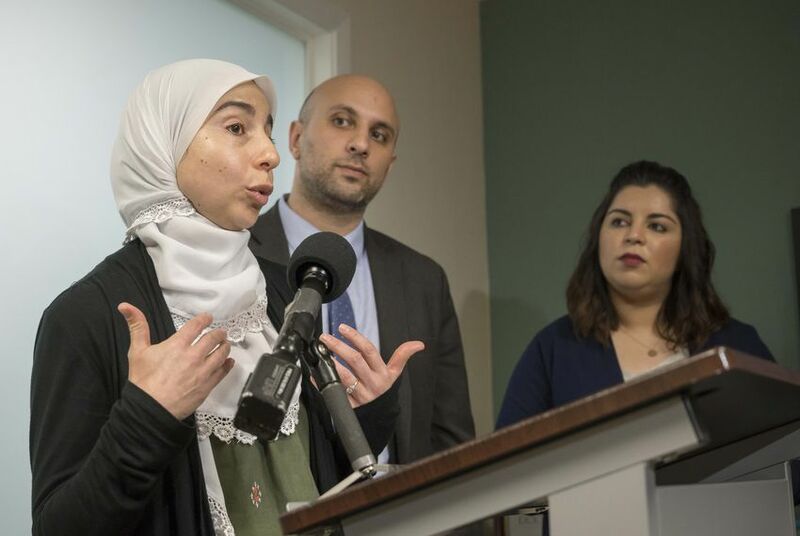 “Texas’ ban on contracting with any boycotter of Israel constitutes viewpoint discrimination that chills constitutionally-protected political advocacy in support of Palestine,” Amawi’s attorneys wrote. Proponents of the law say it's designed to protect an important American ally. During the law’s signing ceremony, Abbott underscored the U.S.-Israel trade partnership, saying that “anti-Israel policies are anti-Texas policies, and we will not tolerate such actions against an important ally.” The governor reaffirmed his support of the law in a tweet on Monday. “When a state wants to engage in business, or bring on folks that want to service the state, I do think it is important for a state to say that if you want our taxpayer dollars, you have to share our common values," said Toba Hellerstein, CEO of the Texas Israel Alliance. According to Palestine Legal, an organization dedicated to Palestinian causes, there are 26 states with a form of anti-boycott legislation. But since Texas' law passed, the law has sparked frequent controversy. Following Hurricane Harvey, the Houston suburb of Dickinson required relief grant applicants to sign a contract with a similar provision to Amawi's. In June, a University of Houston administrator resigned after it was discovered that she forged the signature of a speaker who refused to sign the contract because of the clause, according to the Houston Chronicle. In other instances, for-profit vendors, speakers and contractors for state agencies have raised concerns over the mandated agreement. Amawi, whose story was originally reported by The Intercept, said that the law doesn’t just attack her rights as an American citizen, but touches on her personal experience with the Israeli-Palestinian conflict. An American citizen of Palestinian descent, she said she was forced to make a decision that presented "moral issues," according to court documents. She had to either sign the contract and proceed with the student evaluations that she had lined up for the year, or refuse to work with the school district, she said. “I have a lot of family members who are still in the occupied territory, suffering from the brutality and the aggression and suffering everyday due to the occupation,” she said. Pflugerville ISD declined to address specifics of Amawi's case due to pending legislation, but spokeswoman Tamra Spence said that the district had to follow the state law. "The plaintiff did not agree to the contract as written; therefore, it was unable to be executed in accordance with Texas law,” Spence wrote in an email to the Tribune. While the law in its current state explicitly prohibits state contracts with and investments in companies that boycott Israel, the bill’s author, state Rep. Phil King, R-Weatherford, hinted that there could have been a legal misapplication. "Our state law narrowly regulates against state and local government involvement in discriminatory commercial activity," King wrote in a statement to the Tribune. "It does so in order to defend hundreds of millions of dollars in exports and employment interests that depend upon trade with Israel. States have a long standing precedent for restrictions on government contracting to protect and prevent discrimination." King also said that while the legislation “does not infringe on any individual or company’s right to express anti-Israel views or boycott Israel,” he plans to file a “simple bill” that will help clarify the original intention of the law.